in South Africa and neighbouring countries. Pro Systems has been developing and supplying software to the Sheriff profession since 1989, so we know exactly how a Sheriff works and what a Sheriff needs. 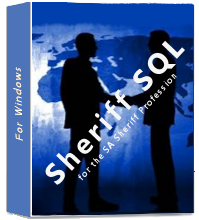 This knowledge has been built into our flagship software package called Sheriff SQL. Our software runs under Windows from Windows 7 right up to and including the latest releases of Windows 10. Staying with our Sheriff's now and in the future. Fax us on 086 551 6903. Call us during the undermentioned times on 082 565 0258. Over weekends and public holidays. During the period of the first Monday in December till the second Monday of January the following year. However, during this time we will be available on normal working days between 08h00 and 09h00 for emergencies only. We support our Sheriff's remotely via the Internet using a customized version of TeamViewer 8. It's a small file and needs no installation. Simply download it and run it. When you see the 9 figure ID you can call us and we'll be on your computer shortly thereafter. To download the file now CLICK HERE. Suggest you save it on the desktop for easy access. Working together to create an efficient legal system.